We supply a large range of driving light wiring harnesses for you to choose from including the Hella XGD wiring harness designed for the Hella Xenon Gas Discharge driving light range. 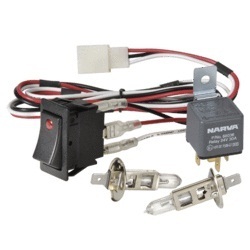 We also supply the Narva universal driving light harness with it's positive/negative switching device making installation to any vehicle an absolute breeze (if you have a modern vehicle we recommend this harness). Also you have to consider what is quickly going to be the most awesome wiring harness for any new installation - The wireless wiring harness??? This amazing harness produced by Predator Performance Lighting does not need to go through your firewall. The switch on your dash communicates wirelessly to a receiver in the engine bay eliminating the need to thread cable down and through the firewall of your vehicle. On top of this it's pricing makes it a harness you can't go past and absolutely terrific value.